With an online terminal, you can process credit card transactions quickly and securely from anywhere in the world—all you need is a device with an internet connection. You can eliminate the need for a standalone terminal, and if you desire, upgrade to a completely cashless payment system for your business. From swiping credit cards with a USB Card Reader to integrating your transactions directly into QuickBooks, there’s no shortage of features that come with an online terminal. With an onlinel Terminal, you can also go Mobile, or tie to a website for e-commerce. All with one account. 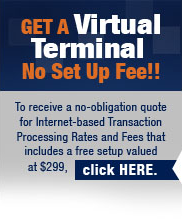 Open your Veritrans Merchant Account today! Our Quick Start Program guarantees same–day application processing. In just 2 days or less you will be able to start accepting credit cards. Already have an account somewhere else? Call Veritrans for a free and con!dential analysis of your current contract and fees. We’ll help you understand your contract better and walk you through some cost–effective card processing services solutions. Call 1-866-474-4144 Opt. 2 today for your FREE consultation.